Moves to impeach Senate President, Senator Bukola Saraki are under way. This is as members of the Senate Unity Forum had started wooing senators loyal to Saraki, mainly the Peoples Democratic Party members. Saturday Punch reports that the SUF members are arguing that the ongoing trial of the Senate President at the Code of Conduct Tribunal was a dent on the image of the Senate. The SUF decided to reach out to their rivals as they need two-thirds of Senators to impeach Saraki. PDP has 49 Senators while APC has 59, excluding Senator Zannah who died. On June 6, 57 out of 108 senators reportedly voted for Saraki. This means that the SUF, which wants Senator Ahmed Lawan to emerge as Senate President, needs 21 more members to achieve victory. But members of the group from the South-West geopolitical zone, told Punch that the SUF will soon hit the 73 figure. He said, “We know that getting the required figure to carry out an impeachment at the moment would be a herculean task, but honestly we hope to achieve it very soon. Already there has been a serious move to get our former party members who are with Saraki now back to our camp. Another source said the group was in a race against time to save President Muhammadu Buhari from facing embarrassment when he finally sends his ministerial list. According to him, Saraki’s loyalists, in retaliation to his predicament, had decided to ridicule the list. It was also gathered that the SUF members were also working on a political solution to execute its agenda. 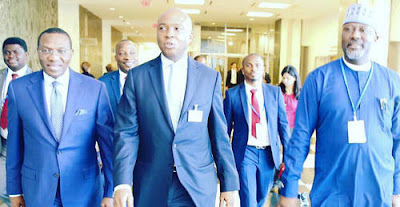 Part of the strategy, the source added, would include sponsoring of a motion by a member of the group to draw the attention of the red chamber to the trial of Saraki and plead with him to save himself from unnecessary distraction by stepping aside for adequate concentration at the tribunal. He said, “Nigerians should not see the on-going trial of the senate president as a witch-hunt, rather, they should rather try and find out whether it was true that he included a multi – million dollar property he bought in 2006 as part of his assets in 2003. “We should stop playing politics with everything in this country. The mantra of the President Muhammadu Buhari administration is anti – corruption and it will not be proper to have a morally deficient person presiding over the affairs of the legislature, being a critical arm of government. Attempts to get the reactions of the National Chairman of the APC, Chief John Odigie-Oyegun, the party’s National Publicity Secretary, Alhaji Lai Mohammed as well as that of the party’s National Leader, Asiwaju Ahmed Tinubu, were unsuccessful. The National Chairman of the party could not be reached as calls to his mobile telephone indicated that it was switched off. Repeated calls to the mobile telephone numbers of Mohammed and Tinubu’s Spokesperson, Mr. Sunday Dare, were neither picked nor returned. A response to text messages sent to them was still being awaited. But reacting, a pro-Saraki senator said the Senate President was not threatened because the CCT had no jurisdiction to try him for any criminal offence. 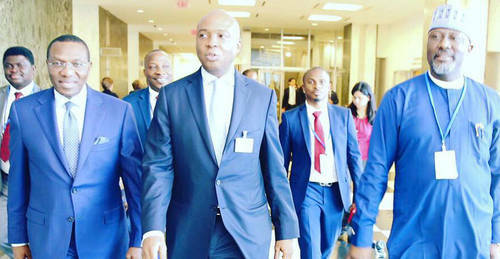 He said, “The idea that members of the SUF are reaching out to pro-Saraki senators in the senate does not arise because majority of the members of the upper chamber had freely elected their presiding officers and would not be in a hurry to remove them because of any politically motivated trial by a tribunal which lacks jurisdiction to do so. “Nobody can impeach or arrest the Senate President, and the lawyers are there to argue out the competence or otherwise of the CCT to try the case preferred against him. More than 80 senators had signed a document with which they unanimously passed a vote of confidence on their president.